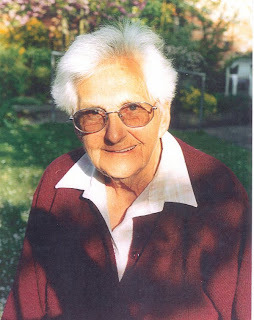 Liz Day, former Bedfordshire Land Girl died on 8 April 2010. This Tribute is taken from the funeral ceremony arranged by Stephen Brand and held as a celebration of her life at Norse Road Crematorium, Bedford, on Tuesday 27 April 2010 at 11.30am. The service was conducted by Carolanne Gibson, Civil Funeral Celebrant. Liz was a very sociable, well-liked lady who had many friends. She was certainly determined and strong minded and she liked to get the most out of life. Elizabeth Mary Blair Day was born on the 26th April 1913, the eldest of seven children. She had two brothers and four sisters, and is survived by her sister Jane in Canada. She came from a farming background and the family lived at Dungee Farm in Odell. Later they moved to Bedford. At the beginning of the Second World War, Liz joined the ATS, having been a part-time member of the Women’s Legion of Motor Transport, a territorial organisation which trained in the evenings. Most of the time, Liz worked in the outdoor gang at the nursery but in the summer season she would take an over-laden 2 and half ton Commer Lorry at least once a week to deliver 12 pound boxes of tomatoes to the wholesale markets in Coventry. Sometimes she had to find alternative routes, following bomb damage in the Midlands. She could appreciate more than most just how difficult it must have been for young women from towns and cities who found themselves doing hard physical work in the open air. Liz was used to the work and the weather. In terms of social life, she would meet friends at The Anchor Pub in Great Barford on Friday nights. There were May festivities and gymkhanas were very popular. Because of her previous experience with horses, Liz could be seen annually in Russell Park in Bedford on Farm Sunday driving horses from Godber’s Nursery. She also cycled to the BBC Music symphony concerts when they were resident in Bedford. For recreation she liked to play hockey and cricket. One of Liz’s personal highlights in the Women’s Land Army was when, at Cople Hostel, there was a visit by the Duchess of Gloucester to inspect the land girls. Liz was chosen to present to the Duchess a basket of apples and eggs surrounded by snowdrops, daffodils and anemones, picked from the hostel garden. In February 1946, Princess Elizabeth visited Bedford. In the victory parade along the High Street Liz drove a tractor past the Princess who took the salute. Later, the Princess opened an exhibition of agricultural work and handicrafts. Luton Museum had loaned some old farming implements to the exhibition and Liz’s father was called upon to identify some of the rare items for labelling. Rather than being demobilised, as the majority of Bedfordshire Land girls were after the February 1946 parade, Liz decided to stay on. In total she served for 10 years in the Land Army. In 1947, Liz took four Women’s Land Army proficiency tests and gained three distinctions. She transferred to horticulture, where the work was somewhat lighter than general farm work. She worked briefly with gangs doing experimental work with Unilever at Colmworth. Because of Liz’s interest in agriculture she had already completed a correspondence course on ‘Elements of Agriculture’. At the end of the war she was one of the fortunate ones who got a grant to do a full-time course in horticulture at the Kent Horticulture Institute at Swanley. Once the news was out she was ribbed by all her fellow students at Swanley who came up with their own rude abbreviations as alternatives to BEM. They wrote ‘NBG’ on her dormitory door which stood for ‘no bloody good’ [but only in jest]. Liz ended her working life as a ‘groundsman’ at the women’s physical education teacher training college in Bedford. She worked at the college for 30 years. A well travelled representative from Fisons, who knew all the leading groundsmen once pointed out to her that she was the only female head ‘groundsman’ in the country. Liz had many hobbies throughout her life. She enjoyed carpentry, working mainly with oak, and the family still have the wonderful tables and stools that she made. She loved the outdoors and wildlife and had many happy holidays travelling around Britain with the Ramblers Association. In later life she enjoyed adult learning courses at the Retirement Education Centre and she made many friends there. With her health failing, Liz moved into Henrietta House in December 2008. The family would like to thank all the staff for the excellent care that they gave to Liz during her time there. The family have gained strength from Liz. She was a dear aunt to Stephen, Hazel and Tom and a special great aunt to Jackie. She was a very special, inspirational woman who will be sadly missed. For more details of Liz Day’s experience in the Bedfordshire Women’s Land Army, and period photos see We wouldn’t have missed it for the World by Stuart Antrobus (Book Castle Publishing, 2008), pp.82-3; 172-6. Photograph courtesy of Stuart Antrobus who also contributed this piece. A lovely tribute to a relation, first cousin once removed, whom I never met. Thanks are due to Tom Batty for alerting me to this.